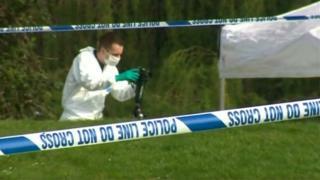 A teenager accused of two murders told police he was hunting a third victim when he was caught, a court has heard. The 17-year-old, has admitted the manslaughter of James Attfield, 33, and Nahid Almanea, 31, in 2014. Guildford Crown Court previously heard he was carrying a knife and wearing latex gloves when he was arrested in May 2015 near the site of Miss Almanea's death. He denies murdering both victims on the grounds of diminished responsibility. The boy was apprehended after he was spotted acting suspiciously on the Salary Brook Trail and later told police he was "going to get my third victim, but there was no-one about". In a police interview played to jurors, he said voices told him to carry out the killings. During the recording he describes how, whilst in police custody, the voices told him to attack a female detention officer. "When the police lady came to my cell the voices told me to strangle her," he is heard to say. "I was taken out to the exercise yard and they locked me out. "That was a good thing because otherwise I would have got her." He went on to describe how he would have strangled her. While in custody, the teenager also told police he was "a bit sad" about the killings. "At the time I thought it was a good thing," he said. "I thought it was the right thing. I was getting rid of the sinners."